A pretty amazing action movie where the martial arts choreography is top of the line, the scenery and direction are beautiful, and the story is pretty interesting. Jet Li is one of the greatest action movie stars of all time. there’s only a hand full of names on the list of the very best Hong Kong action stars. Bruce Lee, Jackie Chan, Chow Yun Fat, Donnie Yen, and Jet Li. each one of these stars has his own style and weapon and skill. With jet li, it’s his kicks. he has ways of putting a hand down on the floor and making his kicks fall from up high to land on an opponent, or of doing a backwards round house kick right as an opponent is jumping at him in the air. Jet Li even can do double and triple kicks in the air (with the use of strings, i’m sure). and all of these moves are on full display in fist of legend. the movie is a lot of fun. of course the number one thing about it is the action. the stunt choreographer here is legendary action master yuen woo ping, who really is the best in the industry. this is the guy who did all the work on hong kong classics like once upon a time in china II (one of my favorites) and american classics like the matrix. 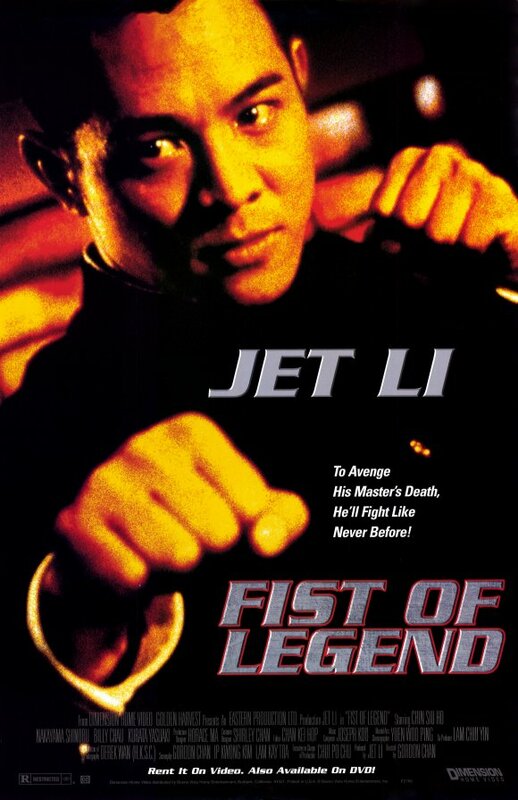 and fist of legend is absolutely one of his best. in fact, it’s the movie that made those matrix brothers (the wachowskis), hire woo ping for their film. it’s also the movie that everybody knows is great, no matter what level of love for hong kong cinema you have. this is the film that samuel l. jackson and quentin tarantino bonded over. so, while there is no question that this movie is great, for me i always felt like it was a little too mainstream. i tend to like things that are a little bigger, from enter the dragon with the hall of mirrors to hero, with the massive amount of arrows flying through the air. but as far as hand to hand combat goes and stripping things down to the basics, fist of legend is probably as good as it gets. the movie is about china vs. japan. more specifically, it is about a rivalry that has been going on between a japanese school of karate and a chinese school of kung fu. 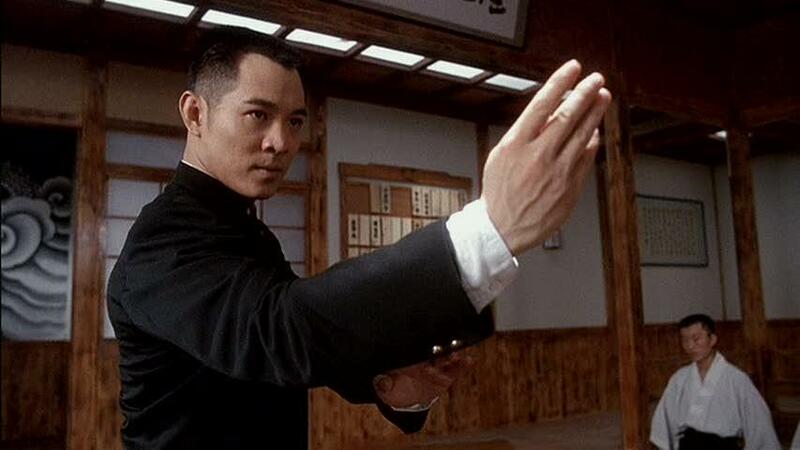 it all starts with kung fu master chen (jet li) learning in a japanese classroom, where apparently he is not wanted. chen has a relationship going with one of the japanese women in the class, and that makes the other japanese men even angrier. they bust into the classroom and attempt to kick chen out. that leads to a solid fight where chen demonstrates some of his skill. when the more mature japanese master shows up, he apologizes for his students’ behavior and asks chen who his master is. chen tells him, and this japanese master sadly informs chen that his master over in shanghai has been killed. now the movie becomes about finding out who killed chen’s master, how he was killed, and why. only it’s not as simple as the standard hollywood mystery where clues need to be put together and take the character from one place to another. instead, in this movie, the master was killed in a fight. and it was a fight he should not have lost. so the real question is how was he killed in this fight. chen first goes to the japanese temple to fight the man who killed his master. he defeats this man easily, and so he knows that there is no reason why his master should have lost to him. chen is confused as he returns to his school in shanghai to find that there is a new leader in charge, his old friend, huo ting’en. meanwhile, back in japan, the guy who lost to chen now realizes that his fight against the master was fixed. the master must have been poisoned. only before he can do anything with this information, the man who did the poisoning, general fujita, kills him. if this kind of storyline was handled with a little more polish, then this could have been one of the great surprising moments of the movie. whenever a main character realizes something and then is immediately killed, it’s always great, from the moment in l.a. confidential to the one in minority report. here, this is such an action movie, that it doesn’t handle know how to handle the moment as well as it should have. even still, the plot moves forward and chen goes on trial for supposedly killing that man who beat his master. chen wins the trial thanks to the testimony of his girlfriend, mitsuko, but after the trial is over, things are not so great back in chen’s shanghai school. he is no longer wanted there, at least not if mitsuko is there with him. his old friend, huo ting’en challenges him and the two men fight. chen wins, but still leaves the school and goes to live with mitsuko out in the prairie. i love that even with chen leaving the school, and going out into the open countryside, we still get action scenes. there is the one back at the school, where japanese warriors attack and we get a large battle. that scene with lots of people fighting all at once, ends up being pretty fantastic, and even reminiscent of some war movies, the way that each individual fight is clearly choreographed despite them all going on at the same time. and then we also get a fight out in the countryside, when the japanese master comes to visit chen and ends up challenging him. i’m not sure that all these fights are necessary, (for example, wasn’t this master just coming to give chen some advice? ), but even still, they are fun. and when you’ve got the greatest fight choreographer working with one of the greatest martial artists in cinema history, the more fights the better. this one even involves blindfolds. chen ends up getting to the bottom of the mystery involving his masters death and then going back to japan to take on the general. and that general is one big, bad, guy. we watch him train by breaking all kinds of crazy things with different parts of his body and it reminds me of watching the russian fighter train in rocky IV. these villains are larger than life, and almost inhuman and i love the setup that proceeds us watching our heroes take them on. fist of legend has some of the greatest action scenes of all time. it also has a pretty cool story to go along with them. there’s not only mystery and murder here, but also a story of japanese and chinese racist feelings towards each other and a sort of romeo and juliet like romance between characters from the two rival schools. mitsuko might not be a martial arts master herself, but her uncle is the head of the japanese school. at times it feels like the story could have been handled better. after all, it is a fantastic story and it doesn’t always come across that way. but the action is always top notch and the story finds clever ways to get us into these fight scenes. this movie is a lot of fun.